I know a lot of people are waiting for this post as I received so many messages want me to post the result! It's less flabby and becomes much firmer!! Before the treatment, can tell that my upper arm is very wide, and getting slimmer around elbow ._. But right now it's quite even!! 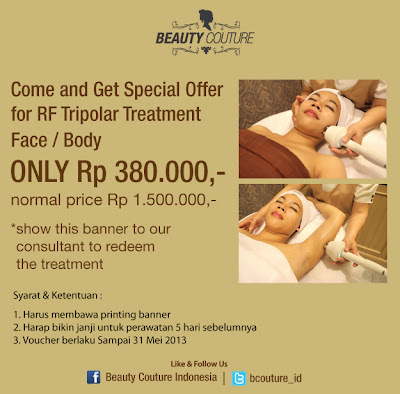 If you're interested to try the same treatment as well, might as well to try this coupon code special for my readers!! I think the price isn't bad, but you need to do it at least once a week to get the result. And for faster result, twice a week like me.. Right now my weight is 41-42kg's, thanks to my diet that I have been doing diligently since I'm coming back from Japan.. So reducing fat on me, is kinda difficult. The result is much better for those who are a little chubbier.. I just wanna say that, if you're heavier than me, you may see better result, and it will be faster! 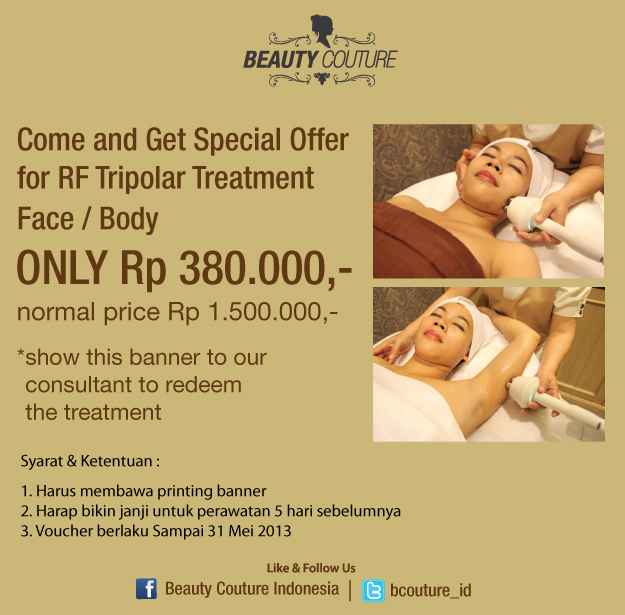 So if you want to get the treatment as well [I really recommend the upper arm so we can wear sleeveless dress yeay lol], you may book the treatment first by calling 021-5639968 and arrange the appointment. Then come with the printed coupon!! woow you're so skinny!! may i know your height rite now? Itu 380k per session jadinya? *_* berarti kalo misal ambil 10x jg terhitung 3.800k? Erm, one question: why don't you just get pair of weights and do few moves every day? :) That way you get actual muscle to replace the fat and your arms are a lot firmer. Don't take too heavy weights if you only want to make your arms firmer and don't want to see big muscles develop ;) Ppl should do sports to stay healthy and fit ^^ Even if it's just arms. i used to do that, and gym.. but i gained muscles instead =_="
tanganku juga gede banget atasnya .___. btw, iya 10x jadi 3,8jt, ak baru telponan sm orang BC-nya lagi buat mastiin..
Cuma trial aja gitu.. ga bisa as many as i want before 31 May..